A few years ago, I had noticed a “new drink” at the grocery store. I plucked the bottle off the shelf in the cooler and turned it over in my hands, reading the label. It made mention of kefir, probiotics, and fermentation. I think the word that stuck out most to me was “fermentation”. When I thought of fermentation I envisioned rotting food with fruit flies swarming all around it. I can recall taking a sip of fermented orange juice as a child and spitting the acidic substance out due to how bad it tasted. I can still remember that juice biting my tongue. Yuck. Anyway, I placed the bottle back on the shelve, grabbed my phone, and looked up kefir. Isn’t nice how we basically have the internet in our pockets these days? What I discovered was that water kefir is like a fizzy soda pop and it contains all sorts of good-for-you stuff like probiotics. I was also able to get a brief understanding of what intentional fermentation of food is and why it is so beneficial. By that point, my curiosity was piqued. I grabbed the bottle of kefir back off the shelf and placed it in my shopping cart. I think the flavor was lemon cayenne ginger. Later that day, I was at home and eagerly poured myself a glass of this weird bottle of kefir I had sitting in my refrigerator. It smelled pretty strongly but not in a foul way. Gingerly, I took a small sip. Not bad! I took another sip but a bigger one this time, really allowing my palate to experience the fizzy flavors of this wondrous kefir soda. Wouldn’t you know, I really liked this stuff! I must admit, I wasn’t optimistic in the least because of that whole fermentation thing. However, I soon found out that fermented foods and drinks are really good for you gut health. It also never dawned on me that sauerkraut is a fermented food and I had been eating it for years. Knowledge is power, people. So, with my water kefir soda in hand, I sat down at my computer and began a more in-depth research process on kefir, what it is, what it does, and how it is made. That’s one thing about me, I’ll research new things until the ends of the earth. I also tend to make my own products, if possible. Let’s dive right into some FAQs about water kefir grains. If you are new to this whole kefir business like I was, I’m sure you have many questions. So, what is water kefir anyway? Water kefir is a probiotic drink that is made with water kefir grains. Water kefir grains are tiny little pebbles of bacteria and yeast that co-exist in a symbiotic relationship. The only reason why kefir is referred to as “grains” is because of how they look. There isn’t any actual grain in them. So, no worries low-carb and/or gluten-free, folks. You won’t find any wheat products in kefir. How are water kefir grains made? Can you reuse water kefir grains? Yep! Those little guys will continue to grow and grow. In fact, you will find yourself sharing them with friends and family because they just keep getting bigger in size and doubling themselves. Once you finish culturing a batch of water kefir (soda), simply remove the grains from the liquid and place them into a jar of sugar water. You can also use coconut water or juice. However, if you only have one batch of grains I wouldn’t stick them in coconut water or juice as these liquids can be sort of tough on the grains. Set aside a batch of grains exclusively for juice/coconut water. If you take care of your water kefir grains they can live forever. Yep, those little grains are immortal. You can use them over and over again in making water kefir soda. How do you care for water kefir grains? Leave your water kefir grains in a sugar water when you aren’t using them. You should replace the sugar water after 3 days. You see, the sugar “feeds” the grains and after about 3 days all of the “food” has been eaten up. If you don’t continue to feed your water kefir grains they will literally starve and die. Can you drink the sugar water that the kefir grains sat in? You can, but I don’t recommend it unless you’d like to give yourself an insulin shot. You see, unlike the culturing process where the grains are removing sugar from the water, the process of rehydrating means the grains are only replenishing themselves and they leave much of the sugar behind. Rehydration is what occurs when the grains are not actively in use and are just sort of hanging out in their sugar water hotel. Now you know all about water kefir grains and how to keep them alive and well. Lets move on to an easy step-by-step water kefir soda recipe. ¼ cup of sugar (I prefer organic cane) per quart of water. Do not use honey! Dissolve the sugar in a small amount of hot water in the half-gallon jar. If you want to make the entire half-gallon you will need to use ½ cup of sugar. Once the sugar is completely dissolved, fill the jar hallway with cool filtered water. Make sure the water is not warm, this is important. The water must be room temperature. Now, add the water kefir grains to the jar. Cover the jar with either a towel, cheesecloth, or coffee filter and secure with a rubber band. I prefer using a coffee filter. You need to do this so bugs, dust, and little kids don’t get into your water kefir as it is fermenting. Allow the water kefir to sit on the counter or table, undisturbed, for around a day or 2. Try to keep the jar in an environment that is around 70 to 75 degrees. After about 48 hours, strain the kefir grains through non-metal mesh strainer and catch the liquid into another container. I like to use 2-quart sized jars. Restart the entire process by dissolving more sugar in filtered water, adding my cold water to the mix, and placing your kefir grains inside. This is the fun part! During the second ferment, you get to flavor your water kefir. 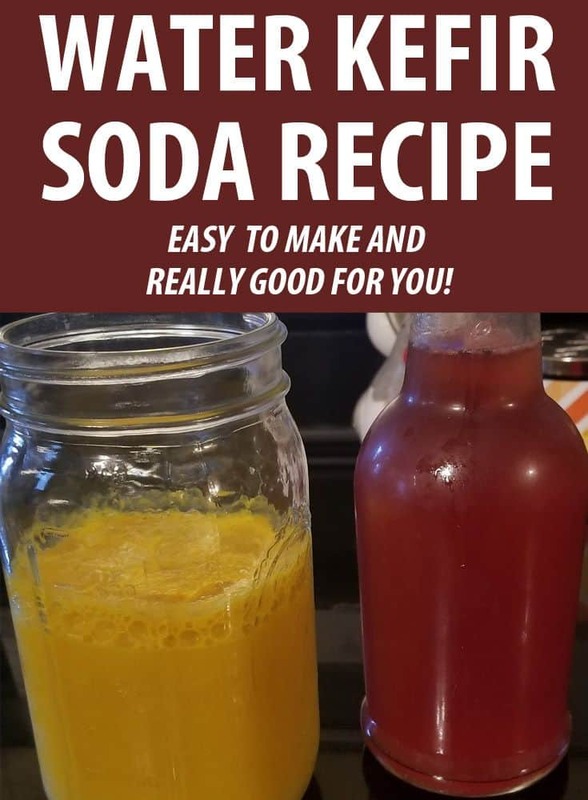 This encourages the water kefir to turn a bit fizzy and is why it is dubbed as “soda” or “pop”. What you need to do is add a couple of ounces of fruit juice to your water kefir that you just strained. DO NOT ADD FRUIT JUICE TO WATER KEFIR GRAINS. Citrus is not recommended because it creates stringy particles that do not taste very good. Maybe try grape or cherry juice, first. 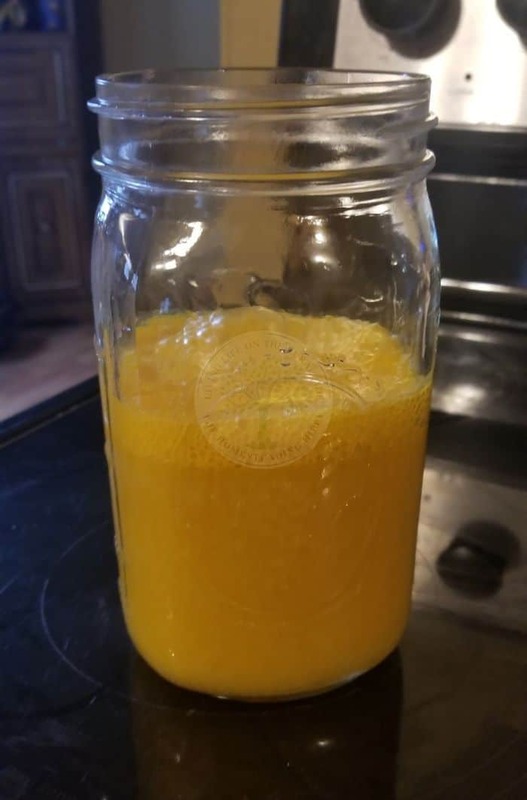 Now that you’ve added your fruit juice, cover the jars with an airtight lid and leave on the counter for an additional 1 to 3 days, depending on how fizzy you want your drink to be. Lastly, place your water kefir soda in the refrigerator as this tops the fermentation process. Your water kefir soda is now ready to drink! The longer you allow your kefir to ferment the less sugar the finished product will contain. However, it is not recommended that you allow your water kefir to ferment (first ferment) for more than 48 hours as by then all of the sugar will be gone, and you don’t want to starve your grains. Feel free to get creative in what you use to flavor your water kefir soda. You aren’t only limited to using fruit juice. You can use actual fruit pieces, herbs, and teas. Add ¼ of lemon juice per quart of water kefir. No need to second ferment, this one. Makes lemonade! Dried fruit/fresh fruit – If using fresh fruit, change it out every 24-hours during the second ferment process. Here is a handy video showing you an easy method of flavoring your water kefir and zapping it into a refreshing soda. So, there you have it. I hope you found this guide to be helpful in your water kefir journey. As you’ve read, water kefir is insanely simple to make. The sky is the limit when flavoring your kefir into a fizzy soda pop-type drink. Get creative and come up with flavors that will make your taste buds swoon. 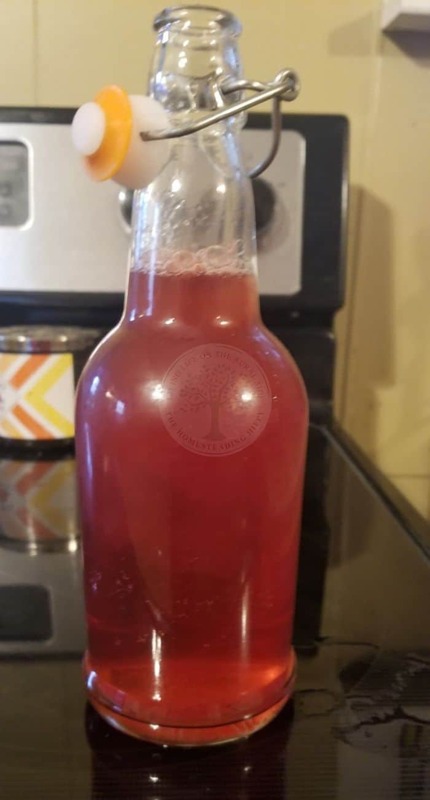 Water kefir soda is a great alternative to actual soda pop. You don’t get any of the gross chemicals and high sugar content. Plus, water kefir soda is insanely good for your gut health. Drink up without guilt, my friend.